From Oakland Tribune, Jan 17, 1912. William T. Ewing was "one of the richest miners in the North," according to a newspaper article published by the Dawson Daily News in September 1908. He was "known all the way from California to Nome and the Klondike as 'Bill Ewing, 'the man of pluck and luck." He was born in slavery to his parents David and Maranda Ewing in August of 1854 at Keytesville, Missouri. It is probable that the family took the last name of the slave owner William Nathaniel Ewing, to whom William T. Ewing's family belonged or was associated with in some other way. Just prior to the Civil War, William Nathaniel Ewing went to college and took many business courses and had an interest in the mining industry. No doubt William T. Ewing acquired some of this business knowledge from his white owner. By 1880, he had moved to Des Moines, Iowa where he worked as a servant for Ebenezer J. Ingersoll of the Hawkeye Insurance Company. This job took him on travels with Mr. Ingersoll along the East coast and as far South as Florida. It was here that Bill Ewing further honed the business skills that would capacitate him to acquire a fortune later in his life. In 1887, Ewing headed West, to Tacoma, Washington. While there he took up homesteading and secured a patent to a ¼ section located in nearby King County in 1890. Over the next few years, he worked several menial jobs until he found employment within the Tacoma Police Department, where one of his duties was driving the horse drawn paddy wagon. However, Tacoma did not offer the kind of opportunity Bill Ewing was seeking, so early in 1896 he left Tacoma and headed North in hopes of securing a better financial future. He arrived in Alaska in March 1896 and by the fall he was at Circle City on the Yukon River. This was right before the big Klondike gold strike. When the big news came downriver, Ewing joined many other miners and made his way to the fabulous new diggings. During his time there he mined on Bonanza, Hunker and several other creeks, as well as owing several mining claims within the Klondike mining district. His mining efforts were successful enough to afford a trip back to his Tacoma property in 1897 for a visit, then returning to the Yukon in 1898. When news of the Nome strike hit Dawson, Ewing joined the great stampede to the new gold fields on the Seward Peninsula. He travelled over 1,200 miles by dog team, arriving there in April of 1900. Nome however, was not to his financial liking, so he returned to Tacoma by the fall of that same year. The following spring Bill Ewing travelled back to Alaska and engaged in a mining partnership with Jesse Noble. They went to the Delta River country and built one of the first cabins in that area. For the next couple of years, they prospected and mined in and around the Chesna Glacier, primarily focusing their efforts on Slate Creek. They arrived at Fairbanks in 1903 by coming down the Tanana river to investigate the promising ground located in the hills North of the new camp on the Chena river. It was in Fairbanks that Bill Ewing finally achieved the financial success he was looking for. At that time Fairbanks had a lot of men with more arriving daily, but no one had any capital. The Fairbanks mines desperately needed monetary investment to purchase the winches, boilers and other equipment needed to drift mine the rich gold laden paystreaks of the Fairbanks District. Many claim owners sat on millions of dollars of untapped pay but could not get it out of the ground because they lacked the money for the equipment to accomplish the task. One of these claim owners was Daniel A. McCarty. McCarty owned Discovery Claim on Fairbanks Creek which he staked on September 12, 1902. One year later, on September 10, 1903 he commenced work sinking a prospect shaft on the lower end of the claim with his wife Sarah. They were living in small cabin they had built, had little food, and they were out of money. The prospect shaft showed six feet of pay that averaged about 2 ½ cents to the pan at an assay value of about $17.00 per ounce. However, the McCarty's did not have the means to develop the prospect, so it sat idle until December 1903. According to testimony given later in a court case, D. A. McCarty stated that he offered fifty percent to any man who would work with him that season. William Ewing not only took McCarty up on the offer, but he also possessed the needed capital to purchase provisions and the equipment to mine the claim, thus providing McCarty a grubstake in addition to the 50% business agreement. Ewing was one of the very few men in the Tanana District who possessed any monetary reserves in 1903. Beginning December 22, 1903, McCarty & Ewing with the help of two hired hands, worked within twenty feet of the boundary line on the lower end of the Fairbanks Creek Discovery Claim, completing their drifting operations by April 17, 1904. They had worked ninety days, and Ewing's share of the profits amounted to $40,000. In June of 1904, the Chena Herald noted that one cleanup from their winter dump netted 200 ounces in 2 ½ days of sluicing. Several years later, in an interview he did for the Oakland Tribune in 1912, Ewing described McCarty as "an upright Alaskan, to whom he has always merited appreciation and retained a close friendship." When the gold started rolling into Ewing's pokes, he took his profits and purchased several empty lots in the new city of Fairbanks, which he sold several months later at a large profit. It was at this time that he began to apply the valuable business knowledge he had absorbed from his younger days. Ewing also purchased Alaskan mining claims and association interests in mining claims. He was well on his way to making his fortune. He left Fairbanks in the fall of 1904 and went back to Tacoma for a while, and then on to Oakland, California where he invested in more real estate. He purchased several properties in the city on Telegraph Avenue, Chestnut Street, West Oakland, and along Foothill Boulevard. Ewing also made further investments in mining and industrial propositions as well. By the early 1920's he was the president of the Trinity Mining Company located in Trinity County, California. All these investments gave him the financial security needed to live out the rest of his days comfortably on the ranch he purchased for himself near Hayward, California. "Mr. Ewing is an exceptional example of his race, and his standing in the commercial world is of the highest. His remarkable success in life is due to his indomitable pluck and perseverance, his conscientious and conservative business policy, backed by a naturally faculty of financiering. Personally, he is a genial gentleman, ever faithful to a friend, and his word is as good as his bond. By his uniform courteous treatment to everybody, and his innate faculty of making and retaining friends, Bill Ewing has the reputation of having more friends in Alaska than any other man during his residence in that territory." When he passed away on April 18, 1923 he had no heirs and his estate was valued at $100,000. In his will he left the entire estate to the Booker T. Washington Institute at Tuskegee, Alabama for the betterment of his race. The will was contested by his cousin and a woman who claimed to be engaged to Ewing at the time of his death. The engagement claim was later dismissed by the court due to a lack of evidence, and the cousin made a financial settlement with the trustees for the Tuskegee Institute for part of the estate proceeds in October of 1923. "William T. Ewing, b. 1854 — d. 1923, a native of Missouri, His estate left to educate his people." Ewing's contribution to mining history is remarkable because his hard work and business acumen had put him in a position to seize opportunity when it came to him on Fairbanks Creek in 1903. He was one of the rare miners that left here with wealth that was not squandered or lost over the years that followed his initial luck. He also continued to be involved in mining ventures & real estate in Alaska, Washington and California until his death in 1923. The fact that he had the desire to leave his entire estate to educate for the betterment of his race rather than bestowing it upon a few individuals, is indicative of his admirable progressive intellect. It also shows that because of William T. Ewing, Fairbanks gold built the fortune that later helped to build the Tuskegee Institute into the modern world class university that it is today. 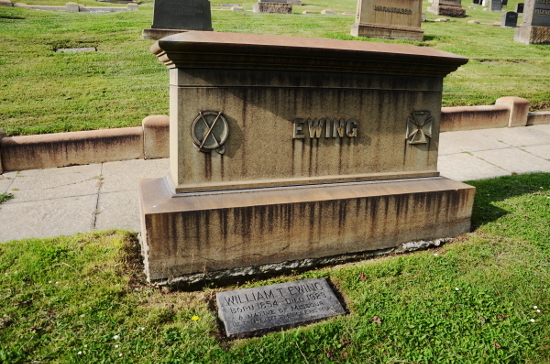 The grave stone of William T. Ewing, in Oakland's Mountain View Cemetery, Plot #52, which states: "William T. Ewing, b. 1854 — d. 1923, a native of Missouri, His estate left to educate his people". 1923 newspaper clippings from an unnamed newspaper published in the Hayward, California vicinity.